he page of Christmas Menus is our family's tried and true choices for the holiday celebration. That doesn't mean we don't experiment or add in new choices, but if we are all going to rely on the memories of good food that means "Christmas" to us, this is what we serve. In our home, the Christmas food fixings are simple for most of the weeks preceding Christmas, we do manage to save some of the cookies we bake for setting out as part of the dessert table on Christmas Eve and Day. We have our most important dinner on Christmas Eve, with a special breakfast/brunch for Christmas Day, if I have not collapsed! The year we stayed up all night finishing the girls doll house was one of those times. I do find that in recent years we ( I) have dropped off many of the cookies baked and the brunch attempts in the effort to simplify. Those things were always so much fun, but sometimes the schedule or the budget don't accommodate everything. 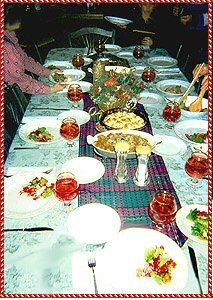 I really think the important thing is the festiveness of the atmosphere with well- chosen foods that create a warm and hospitable table. Usually, we have Italian style foods, but some of the other menus have had their share of use. Some years we will have the stuffed turkey menu, since we missed it at Thanksgiving! The two dishes which my family insists upon, at Christmas, are my Cardamom Rolls, and Cranberry Relish (made the way my mother and Grandmother made it). Recipes for this Christmas menu found here. Recipes for this Christmas or Thanksgiving menu found here. This year's Christmas menu with recipes for all the dishes in this menu. Fennel & Rosemary Beef Tenderloin, Pear and Pomegranate Salad, and more!